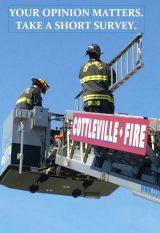 The Cottleville Fire Protection District is hosting our annual Santa Day event on Saturday, Dec 1, 2018, from 10am-2pm. This event will take place at the Fire Station #1 located at 1385 Motherhead Road in Cottleville. We would like to invite the public to come out and meet with Santa, see the fire apparatus, visit emergency personnel, and tour the fire station. We will have free fun activities for this day that will include, a kids’ coloring table, a face painting artist, a balloon artist for the kids, and Home Depot will giving away free build kits for the kids. We will have free kettle corn and drinks for all who attend. In addition, Santa will have his sleigh at the firehouse along with a holiday scene backdrop for those great family photos. Everyone will have the opportunity to enter a free raffle drawing and have a chance to win a child’s bicycle and helmet. Winners of the raffle will have the opportunity to have their bicycle delivered to their home by the firefighters on the firetruck. Each child that visits with Santa will receive a special gift. Come on out and bring the family to experience a truly exciting experience that will fast become a tradition that will keep your family coming back year after year! Santa will have your kids amazed by the things that he knows!